Participants of a good human factors workshop leave the training with a high level of awareness. Unfortunately, unless provided reminders, this level of awareness slowly goes down. One of the means of keeping this level of awareness up is to provide a decal that reminds the person of the Human Factors training they've received. The following have been found to help maintain awareness. 20 copies of the "Advice" laminated card are $15.00 Canadian funds . 100 copies of the "Advice" laminated card are $70.00 Canadian funds. 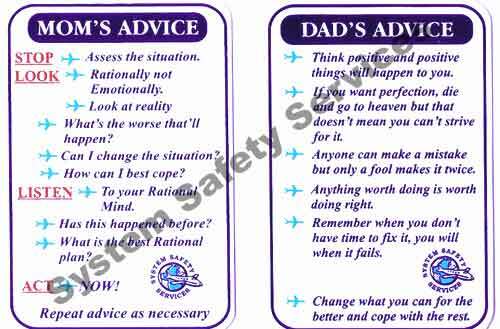 200 copies of the "Advice" laminated card are $130.00 Canadian funds. 500 copies of the "Advice" laminated card are $300.00 Canadian funds. Above 500 of the "Advice" laminated card are 60 Cdn. cents each. Plus $4.00 Canadian shipping and handling.